Introducing HTC Desire 10 pro. With high-resolution cameras back and front, elegant, metallic design, and top-tier features like integrated fingerprint sensor and 64GB internal storage space. All of which add up to make it our best Desire phone yet. HTC Desire 10 Pro smartphone was launched in September 2016. The phone comes with a 5.50-inch touchscreen display with a resolution of 1080 pixels by 1920 pixels at a PPI of 400 pixels per inch. The HTC Desire 10 Pro is powered by 1.8GHz octa-core MediaTek Helio P10 processor and it comes with 3GB of RAM. The phone packs 64GB of internal storage that can be expanded up to 4GB via a microSD card. 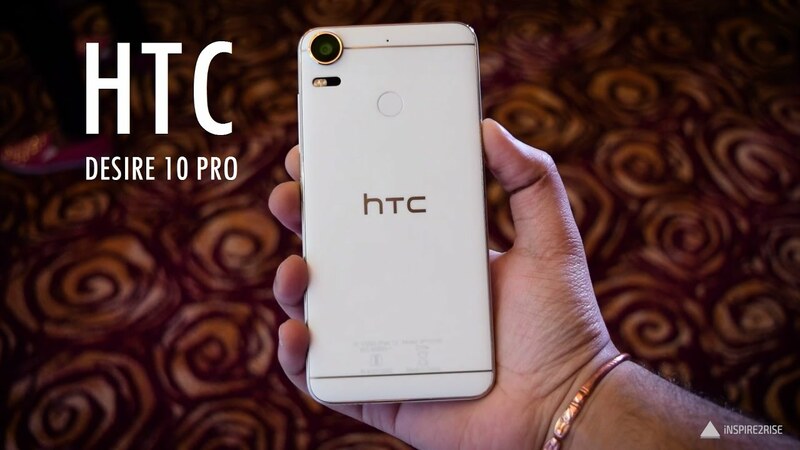 As far as the cameras are concerned, the HTC Desire 10 Pro packs a 20-megapixel primary camera on the rear and a 13-megapixel front shooter for selfies. The HTC Desire 10 Pro runs Android 6.0 and is powered by a 3000mAh non removable battery. It measures 156.50 x 76.00 x 7.86 (height x width x thickness) and weighs 165.00 grams. The HTC Desire 10 Pro is a dual SIM (GSM and GSM) smartphone that accepts Nano-SIM and Nano-SIM. Connectivity options include Wi-Fi, GPS, Bluetooth, USB OTG, FM, 3G and 4G (with support for Band 40 used by some LTE networks in India). Sensors on the phone include Compass Magnetometer, Proximity sensor, Accelerometer, Ambient light sensor and Gyroscope. Dedicated to giving you the best camera experience around, HTC Desire 10 pro features a huge 20MP main camera that provides incredible levels of detail in your photos. It comes with pro-level features like Electronic Image Stabilization for smooth videos, and Auto HDR that combines multiple shots into a single, clear photo that looks amazing even when taken in low light. This camera is fast, too. It takes in-focus photos in a flash thanks to its laser autofocus. Smile for the selfie camera that has the same sensor pixel count as the main camera in many other phones. If you’re serious about great-looking selfies then you’ll appreciate the HTC Desire 10 pro’s 13MP selfie camera. It promises you higher resolution selfies that capture more scenery and good time with friends. This selfie camera also features a built-in screen flash, which helps you take brighter selfies in low light. Make your phone as unique as you are. HTC Freestyle Layout frees you from an onscreen grid and lets you get creative. Drag icons, stickers and widgets anywhere. Layer them, overlap them, group them and more. You can even link stickers to apps, and get rid of onscreen icons entirely. The home screen is yours, use it your way. HTC Desire 10 pro gives you more space for the things that are important with a massive 4GB of RAM and 64GB storage space. So you can load up on photos, videos, movies, games and more. And if that’s not enough room, HTC Desire 10 pro has SD card support for up to 2TB expandable memory. Don’t want to carry two phones? Dual SIM lets you use two SIM cards at once in your phone. It’s great for balancing work and play, or traveling between countries.